Full disclosure: this recipe was developed for Garlic Gold®. Subscribe if you’d like to receive my weekly recipes and how-to’s using their gourmet garlic condiments. I love it when a recipe hits that sweet spot between exotic (or, new to me anyway) and totally comforting. 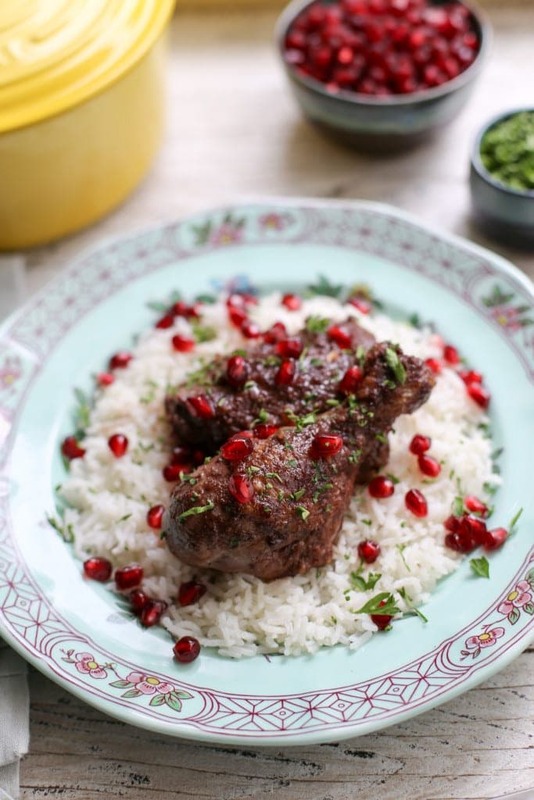 Tender drumsticks and thighs are napped in a rich sauce that’s sweet and tangy with pomegranate paste, with a background of deep roasted flavor from garlic and well-browned, ground walnuts. The flavors are Middle Eastern in origin — this is a simplified take on Fesenjān, a classic Iranian dish. Serve the chicken over rice, with plenty of sauce spooned on top and a pretty sprinkle of parsley and pomegranate arils if you please. It’s easy but elegant, great for weeknights and dinner parties alike. 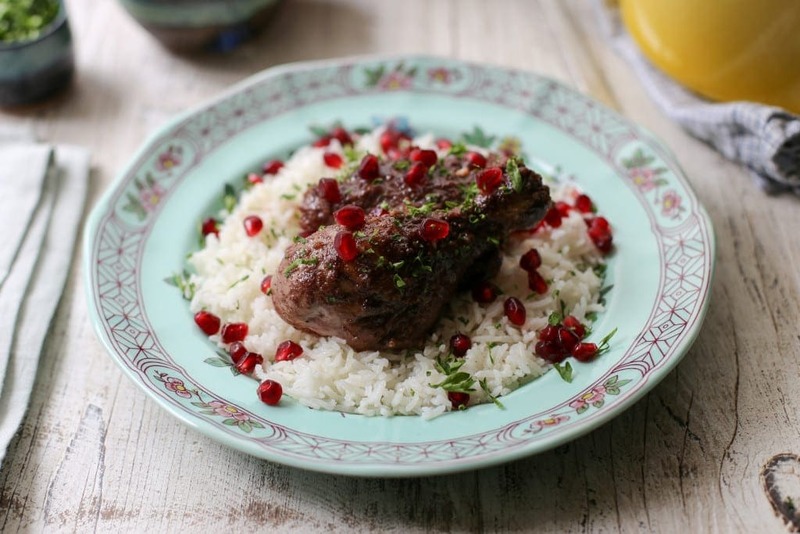 Chicken legs and thighs are simmered in a rich sauce of toasted walnuts and pomegranate molasses. In a food processor, chop the walnuts until finely ground. Liberally salt and pepper the chicken pieces on both sides. In a braising pot or dutch oven, heat the Garlic Gold® Oil or olive oil over medium heat. In two batches, sear the chicken skin side down for five minutes, then flip and sear for another five minutes, until both sides are golden brown. Remove the chicken to a plate and set aside. Add the ground walnuts to the pot and stir until toasted and aromatic, about five minutes. Add the onion and sauté another five to ten minutes, until the onion is a bit softened and translucent. Add the cinnamon and stir for one more minute, until aromatic. Add the pomegranate molasses and broth, stirring to bring up any browned bits from the bottom of the pot. Gently place the chicken pieces back in the pot skin side down, ladling sauce over the top of each one. Bring the liquid up to a simmer, then turn the heat to low, cover, and let simmer for 20 minutes. 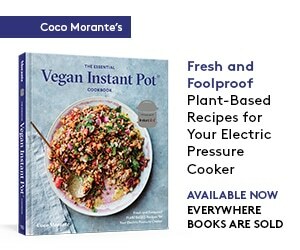 Remove the cover from the pot. Flip the chicken pieces, ladle more sauce over them, and simmer uncovered until chicken is tender and sauce has thickened, about 30 more minutes. 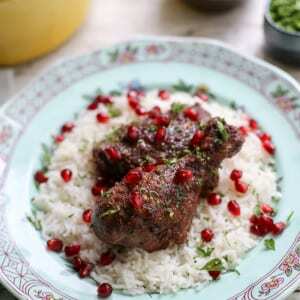 Serve the chicken over steamed rice, with pomegranate seeds and parsley sprinkled on top. Oh man, really glad to see this on here! Though Fesenjān is probably my least favorite Iranian dish on account of being on the sweet side. Literal sweet meat can take people by surprise and some restaurants will serve you a large portion of the sauce / broth, but in my family we usually just ate the meat. This looks great! I love the pomegranate chicken at a Mediterranean restaurant on Fillmore. Thanks! 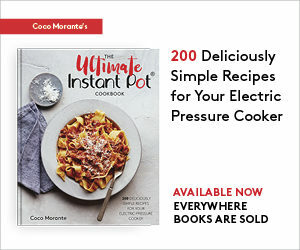 It’s so rich and different from my go-to chicken recipes. I should make this again soon..!